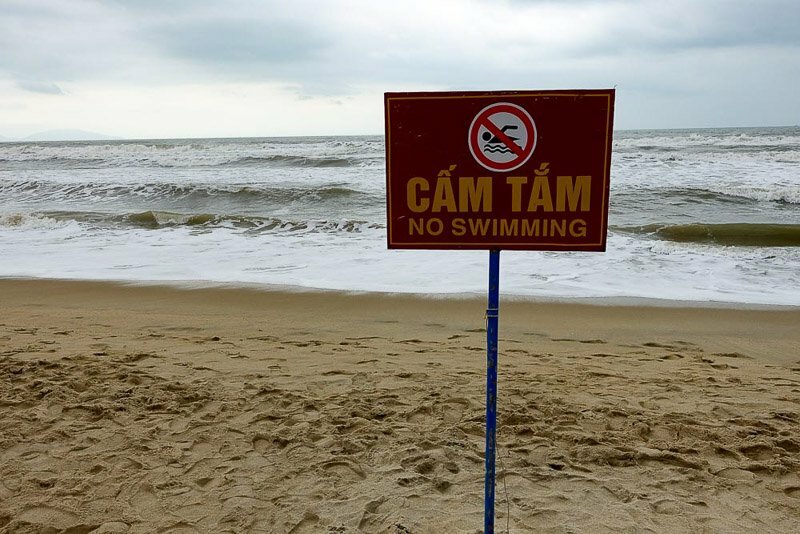 I was looking forward to getting back to Vietnam. 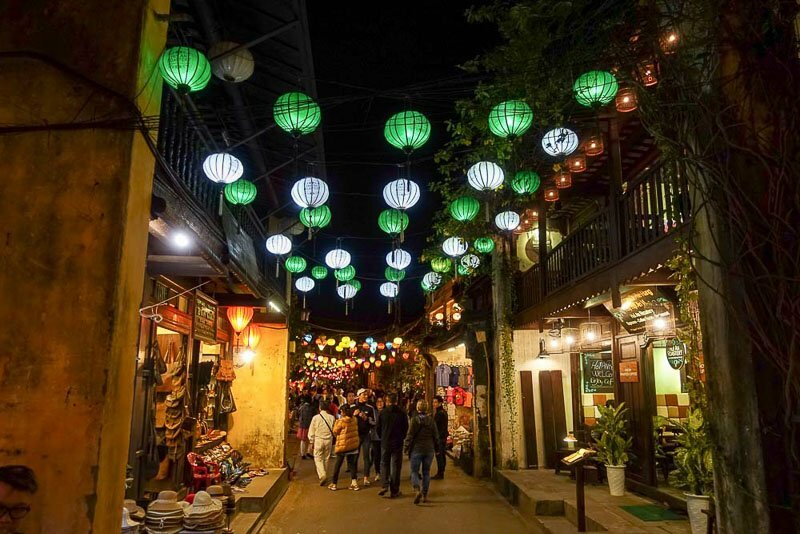 We had spent three weeks here almost exactly five years ago, and had enjoyed our visit to Hoi An then, and wanted to spend a more time around the central area of Vietnam. It had been hot in Cambodia, but the weather for the whole time we were in Vietnam was supposed to be cool and rainy. 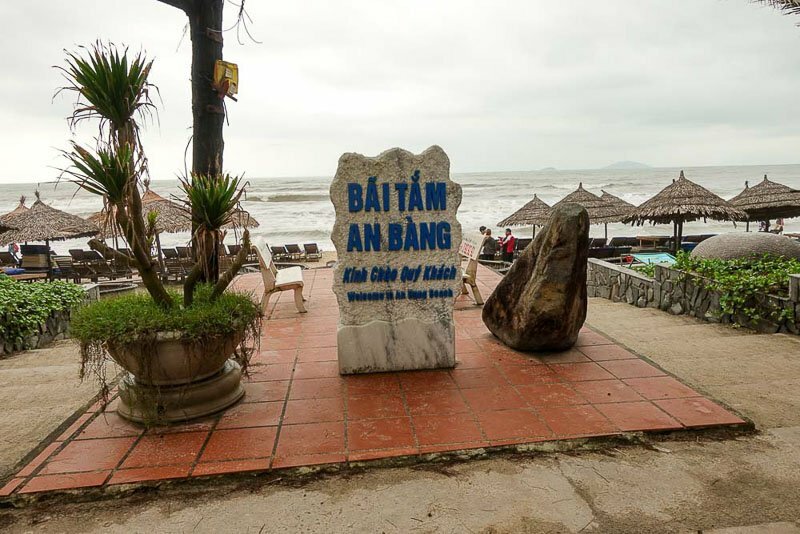 We therefore arrived into Danang to find clouds and wind and had to dig out our jeans and jackets again. 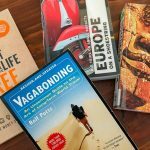 We were staying at Papa Mike Hostel Princess, which I can absolutely recommend for everything except for one small thing – the location. It’s a little way out of the city centre, but only minutes from the beach, so if it had been beach weather this may not have been such an issue. We arrived as the sun went down, and our driver from the hostel picked us up, and we arrived to find a free dinner waiting for us. All night the wind howled, and it didn’t improve much in the morning. Going out into the weather was not very inviting, and we were tossing around ideas for the day when our host offered to take us on a mini tour of the town. So from the dry, warm interior of his car, we saw the city centre, the bridges, beach front, and went up to the lady Buddha statue. We rugged up again a bit later in the day and went out to a local restaurant for dinner, but that was as far as we ventured. We just hoped the next day would be better. Unfortunately it started off just the same, but later in the afternoon the wind died down a bit. 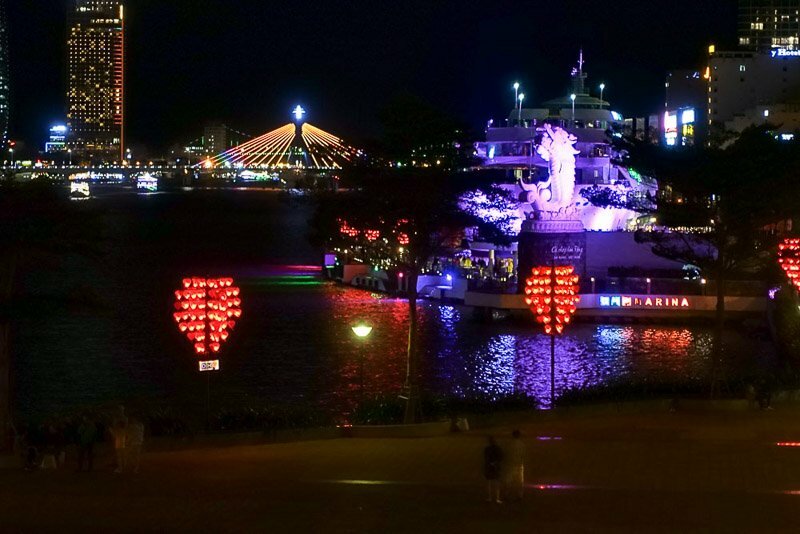 Danang has four distinctive bridges that are all lit up at night and I wanted to see them. It was about a 5km walk to the closest of them, but we had been inside for a couple of days so it was good to get out and stretch our legs. The most well known of the bridges is the Dragon Bridge. 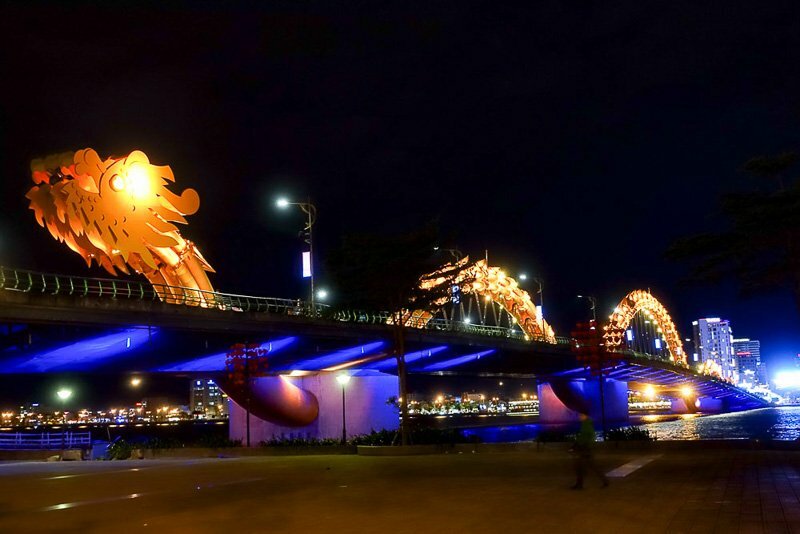 There can be no mistaking this bridge as a Chinese dragon adorns it’s length. On the weekends (which we would unfortunately miss) the dragon shoots fire out of its mouth for the amusement of onlookers. 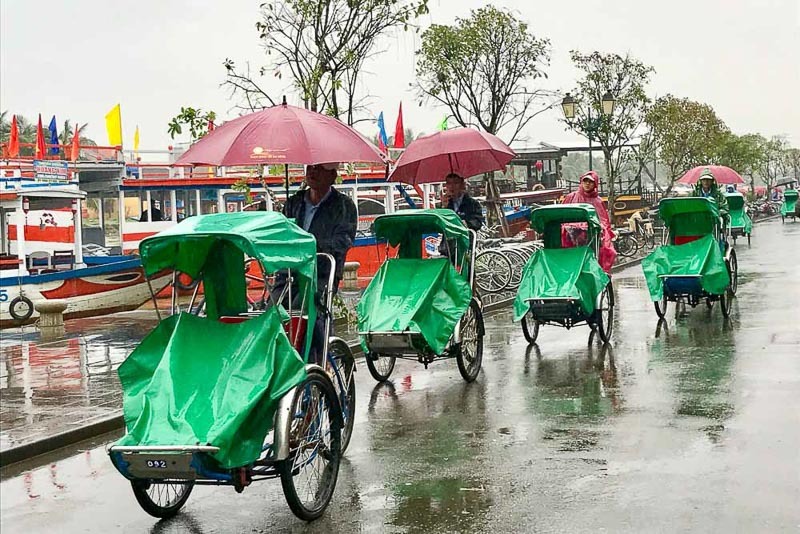 Our next stop, Hoi An, was just 30km down the road from Danang, and while we were planning to catch a public bus between the two towns, our host had other ideas. He dropped us and another couple off in Hoi An for free. So we got free airport transfer and dinner on arrival, a huge breakfast each day, a tour around the city, a private room with ensuite then dropped off in Hoi An, all for the ridiculously cheap price of $28AUD($22USD) per day. 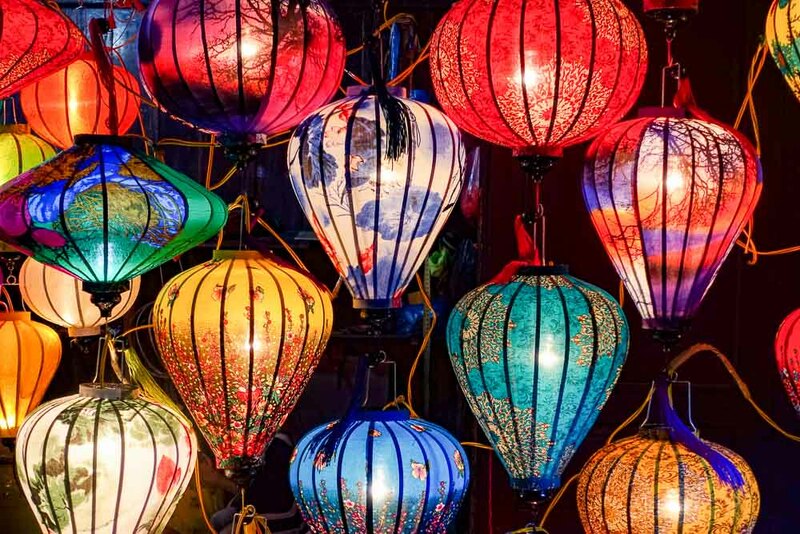 Need to transfer from Da Nang to Hoi An? See my post here about how to do it. When we were in Hoi An in January previously it was warm and sunny, warm enough for the kids to swim in the pool each day. While the wind had stopped, it was still cloudy, cold and every now and then there was rain. We had again booked to stay in a place with a pool, and didn’t get anywhere near it. I have to give a shout out to Vinci Villa Hoi An. They are the first place I have ever seen on Booking.com with a ten rating. And they did not disappoint. 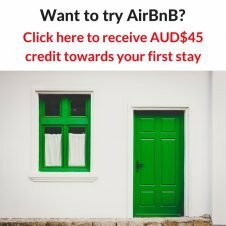 For the price they were absolutely amazing – $32AUD ($26USD) per night! 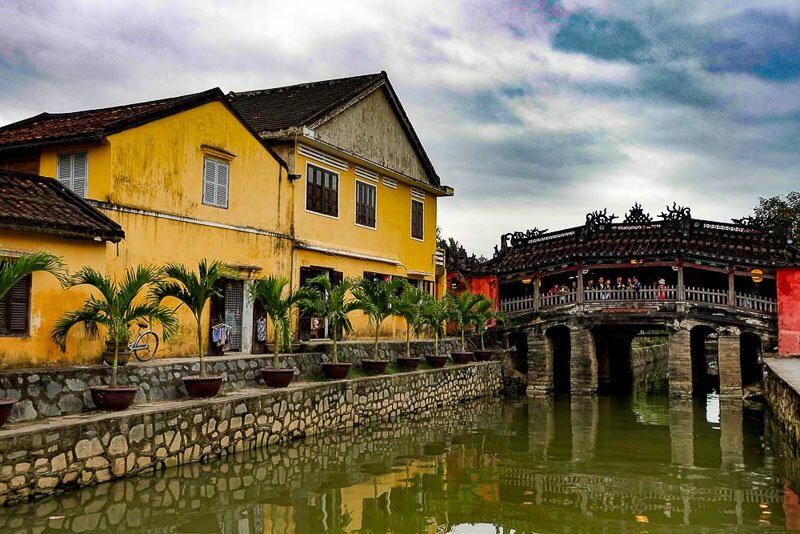 Hoi An itself hasn’t changed much in the last few years, but the number of tourists certainly has. The old town area, particularly around the bridge, was so crowded. I don’t remember any tour groups at all last time, but this time the line of parked buses stretched further than the eye could see. 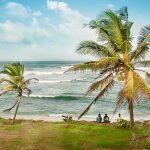 I still loved the town itself though, and we soon took a seat at one of the riverside cafes and indulged in an egg coffee and a coconut coffee while watching to locals and tourists alike. Before our last visit to Vietnam I was told about a local organisation called Blue Dragon Children’s Foundation. They help children in Vietnam that have been trafficked or forced into slavery. That may include the actual rescue, but also education, training, and even housing afterwards. 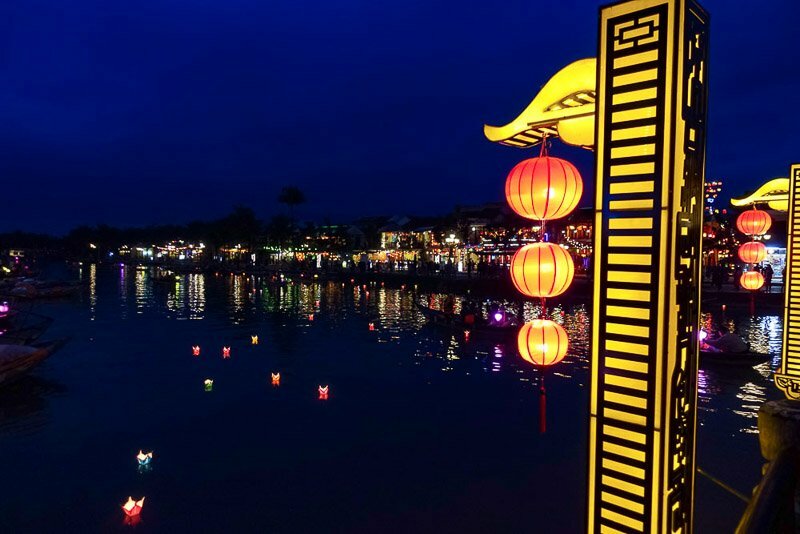 Blue Dragon has a restaurant on the riverfront in Hoi An, where profits go to help the foundation, and often the people working there have been rescued themselves and are learning new skills or training others. 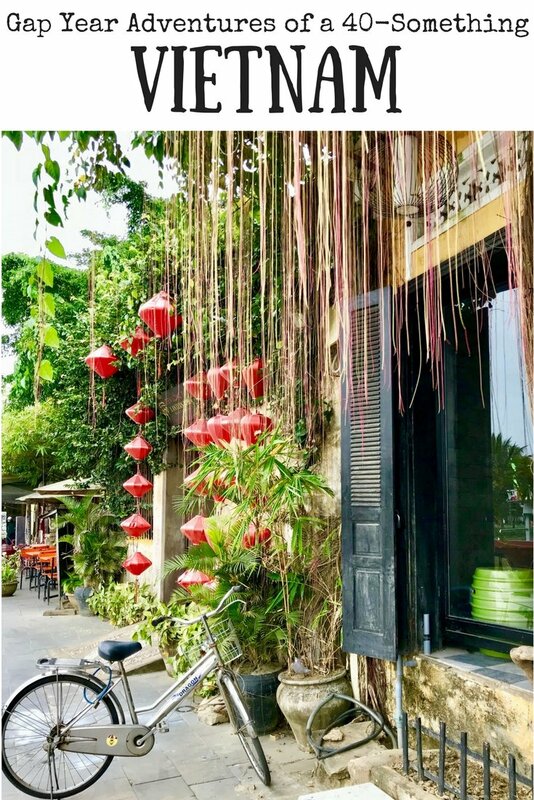 I encourage you to have a look at the work these guys do, and when in Hoi An, pop into the restaurant for a meal – you will be helping their cause and the food is pretty good too. As the sun goes down the lanterns spread throughout the old town light up, giving it such a special feel. Many people buy lanterns from the locals and release them to float down the river for luck. 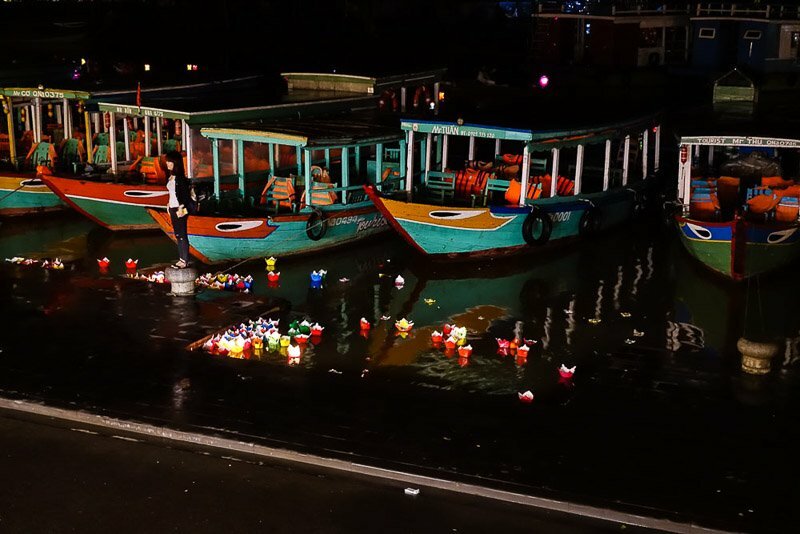 The locals will also give boat rides down the dark river with only lanterns lighting the way. The lanterns all piling up in a corner as the wild winds blow them to one side. 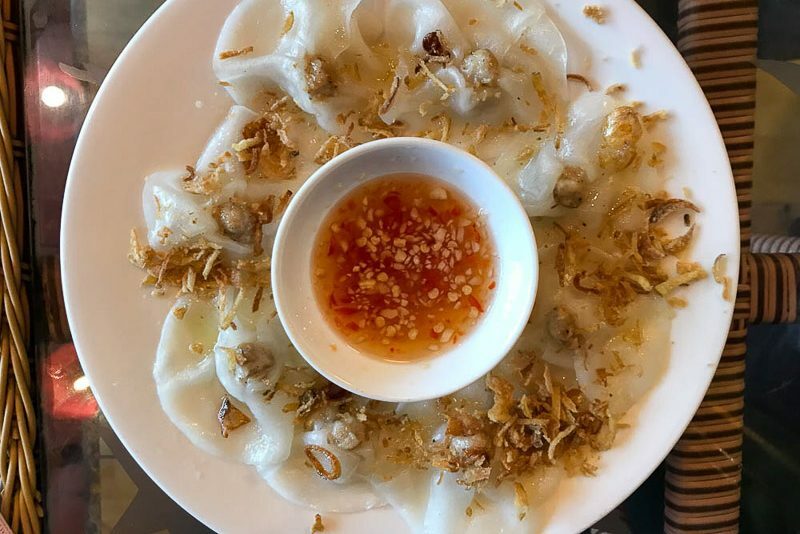 Hoi An White Roses – delicious! 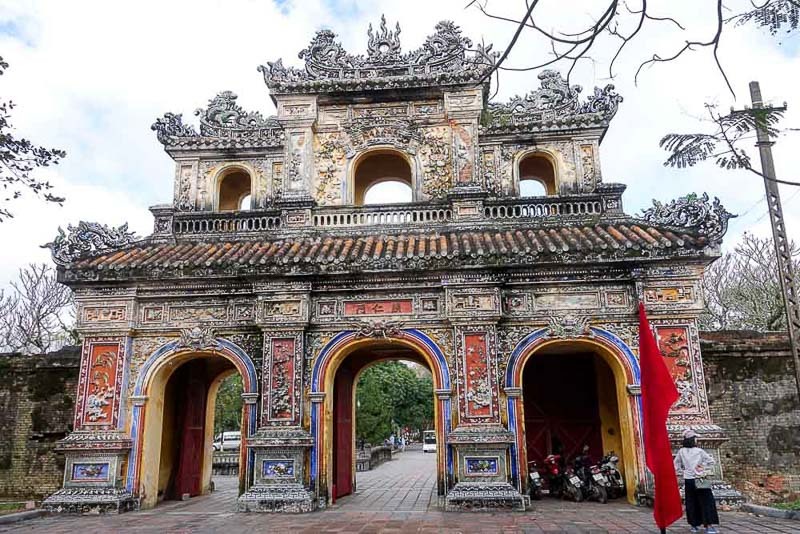 When visiting Hoi An there is a charge of 120000VND ($7AUD/$5USD) to visit the old town. This charge is to help protect and preserve the UNESCO listed area. There are a few booths on the main streets into the area selling the passes, but no actual gates to show them at. The pass should be carried at all times in the heritage area. In theory it would be possible to visit and not pay, but its best to be a responsible tourist and pay up. 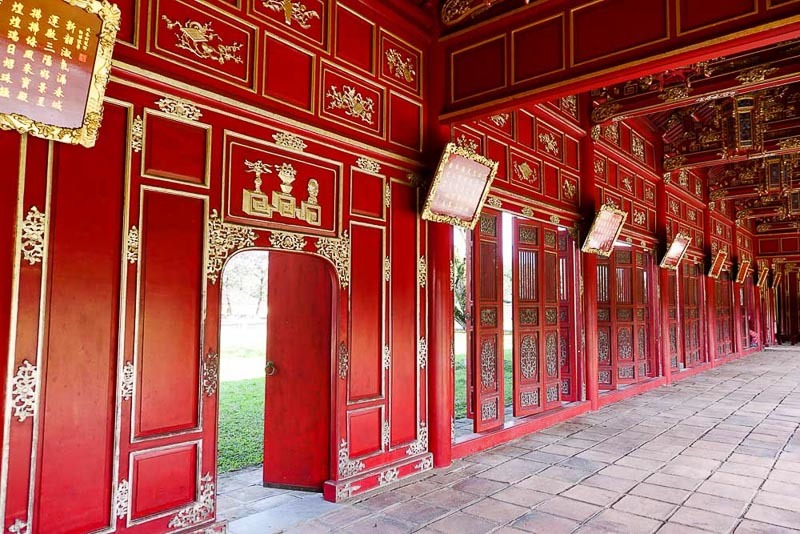 Included in the pass is entry to five of the attractions, which are primarily small museums, temples and clan houses. From what I had read and from my own visits, these are all small places and only of average interest. I found they included little information and were only worth a few minutes each. We spent the first couple of days just hanging around in the town, drinking bucket loads of coconut coffee to keep me warm. We were also on the hunt for some elephant pants. Our daughter MacKenzie is joining us in a few weeks, and she wanted to replace the comfy pants she bought last time she was here. But she wanted to choose the patterns. So I stopped in every little shop (there are heaps! ), looked for likely patterns, dodged the hard sell, took some quick photos and sent them to MacKenzie. Two days of this and we had two pairs of elephant pants in patterns she wanted. After all this sitting around and drinking coffee we needed some exercise, so I thought it might be nice to go for a walk to find the Tomb of the Japanese Trader. While I could regularly find this on things to do lists, instructions on where the tomb actually was were a little vague. “Walk along the road to the beach and you will see the sign.” Umm, no, we didn’t see the sign. But we did enjoy a nice walk through the rice paddy’s all the way to the beach. The wild weather meant to beach was closed to swimming, so we did what anyone would have done – had a coffee! An Bang beach almost looks ready for the days’ hoard of tourists. Pity about the weather. The waves were pounding in at An Bang beach so I am not surprised there was no swimming. As we started the 4.5km walk back to town, it started to rain! It wasn’t really heavy, but constant. Thank goodness we had our rain jackets on and I had grabbed an umbrella. Even better was that we walked on the other side of the road and came across what we thought might be “the sign”. It wasn’t very clear though, and easy to miss. We followed a track between some rice fields, and there was the tomb. The wet, slippery path out to the Tomb of the Japanese Trader. I was sure I was going to end up in a rice field. The Tomb of the Japanese Trader – not much once we found it, but sometimes it’s about the journey not the destination! As we got back into town I saw a temple marked on the map just off the main road. Since we were going past, I had to have a quick look, and this one actually turned out to be better than the others in the heritage area. There were only one of two people around while we were there too, very different to the other temples. 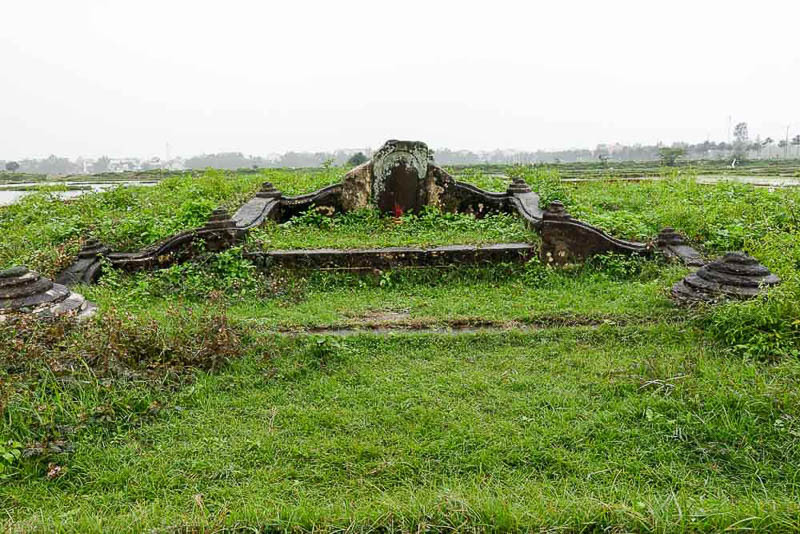 Some of the fascinating tombs in the grounds of Chuc Thanh Pagoda. Our next town was Hue. To get there we had to go back north through Danang, and I decided that we would get the train from there to Hue. 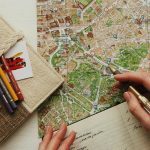 When planning our first trip I had this on my to-do list, but in the end we didn’t have time to fit it in. 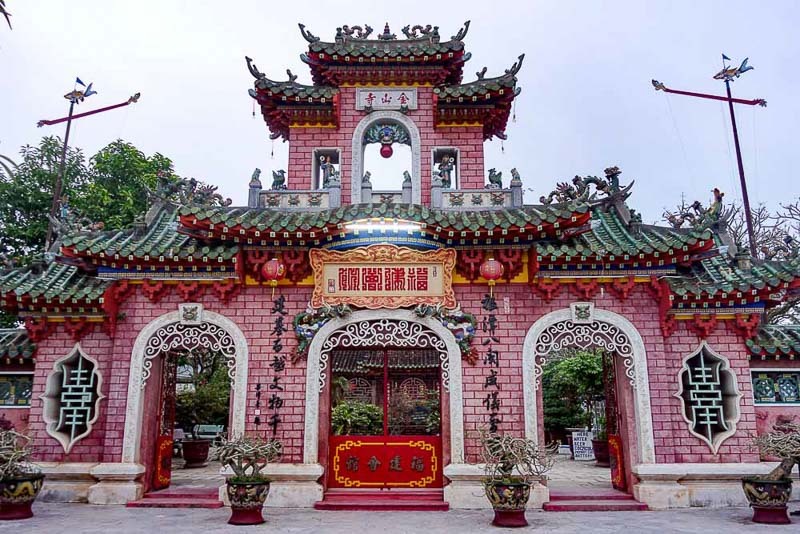 We booked a car from Hoi An to Danang Railway Station, and his driving was so erratic I am fairly sure he had only decided to start driving the day before. He was also continuously on his phone and doing something I really can’t stand – sniffing! I could not get out of that can quick enough! 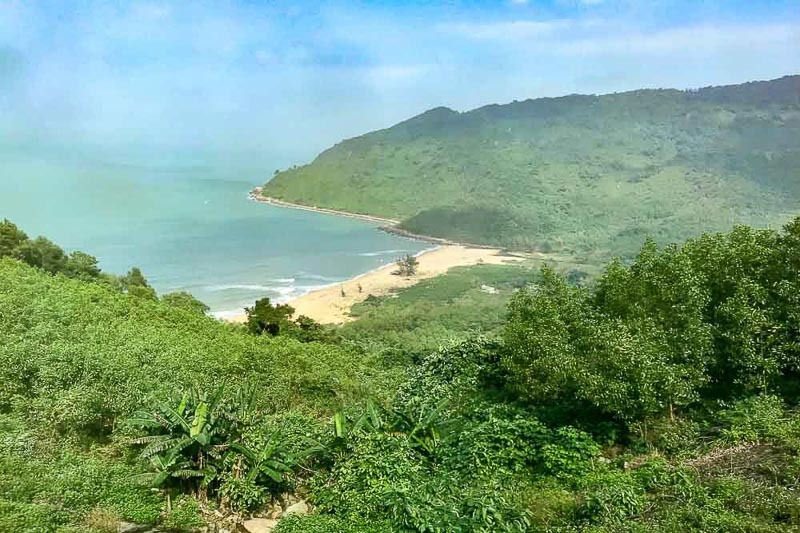 The train from Danang to Hue takes about three hours and runs through some stunning mountainous countryside, mostly with views along the coast and out to sea. It was still cold and overcast with a few spots of rain, but a couple of times during the trip the sun came out making the sea a beautiful blue colour. Sorry for the dirty window haze, but even with that you can see some of the great scenery along the way. We liked Hue immediately. The centre of the city has a very relaxed feel to it, with lots of laid back cafes and bars. We walked around a bit to get our bearings, but mostly just found a place to eat and filled up on delicious Vietnamese food and beer for only a couple of dollars. It was then an early night because we had a big day planned the following morning. We were up, ready and eating breakfast by 6am. Our pickup time for our tour was 6:30-7am. We were still waiting at 7:30 and then when the tour leader arrived, the other couple from our hotel was not ready! It was so bad that once we were all on the bus, the guide actually talked about how people need to be on time because we were now running an hour late! 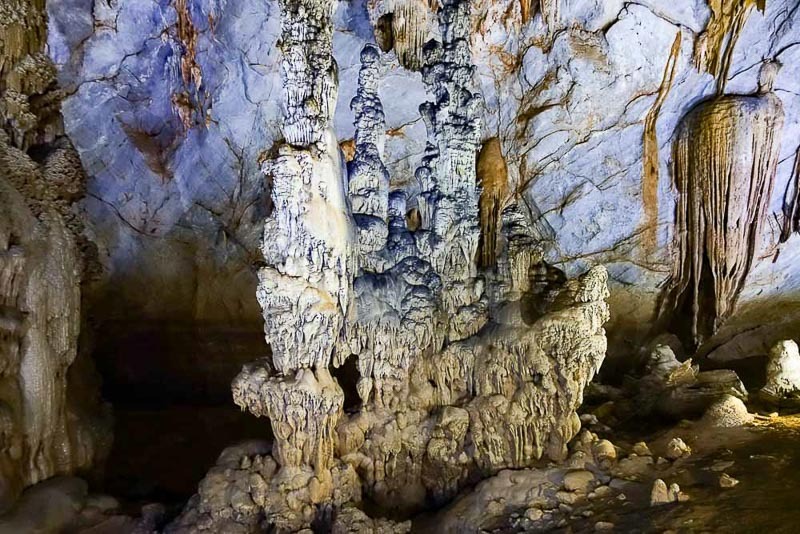 We were on our way to Paradise Cave in Phong Nha National Park. 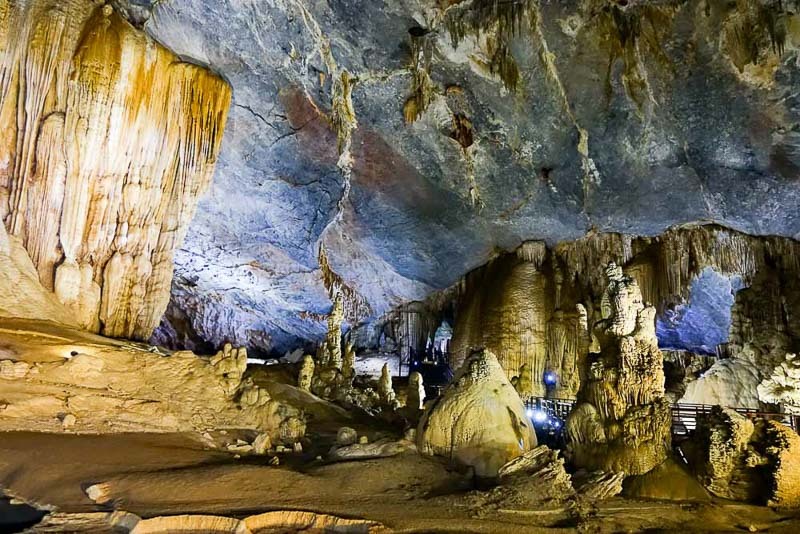 This cave was only discovered in 2005. This whole area is still being explored, and not far away is the largest known cave in the world – that one is just really hard to get to! Paradise Cave on the other hand was opened up to tourists in 2010 and has much better access. There is still a walk of about 1.5km to get to the cave, and the last 500m or so is up some steep walkways and stairs, but overall it is not too difficult. 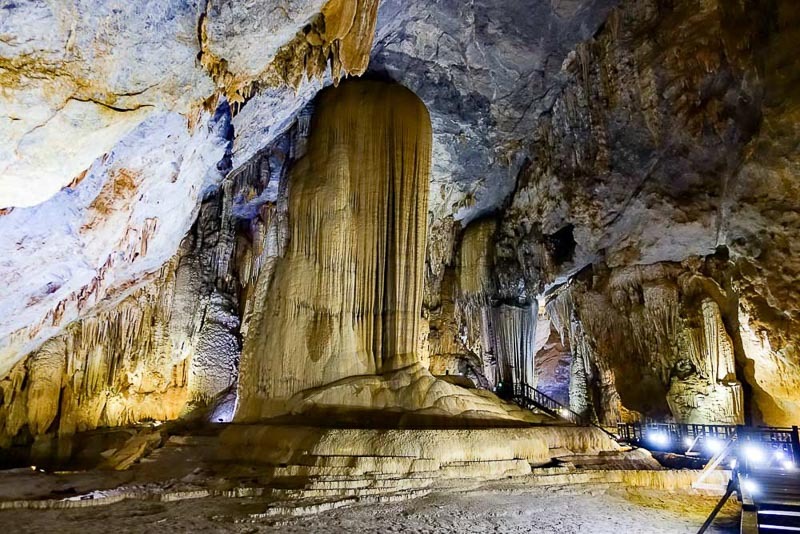 Once inside the cave, there are over 1km of walkways that have been constructed to make viewing easy. We got to spend about 90 minutes inside the cave (cut short because we were running late) and it was really quite spectacular. Unlike other caves I have visited, this one does not feel cold and damp – at least it didn’t in January, the dry season. 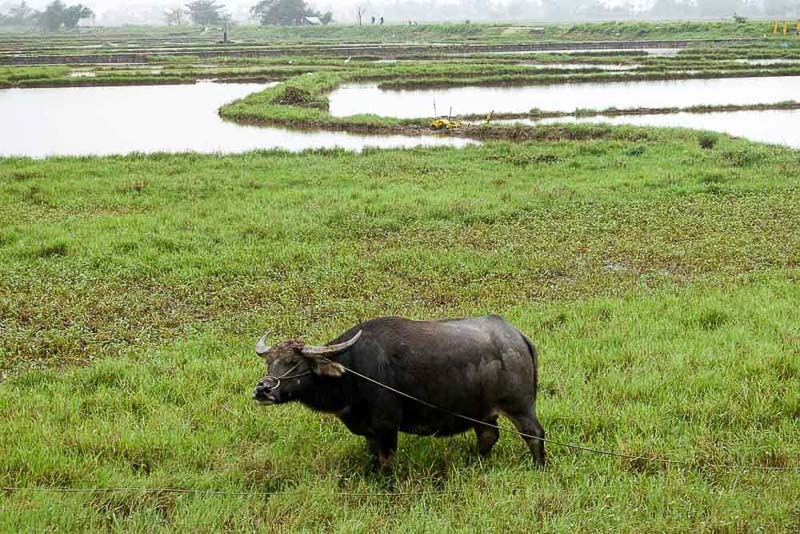 Perhaps it is different in the wet season. Unfortunately I do not recommend this day trip! It’s at least three and a half hours driving each way from Hue so it’s a very long day. Lunch was included, but it was nothing to rave about. It was in one of those places that caters for tour buses, so we were placed at a table and a whole pile of dishes were served with cold Vietnamese tea. Other drinks if you wanted them were exhoribantly priced, and there were no choices of food. 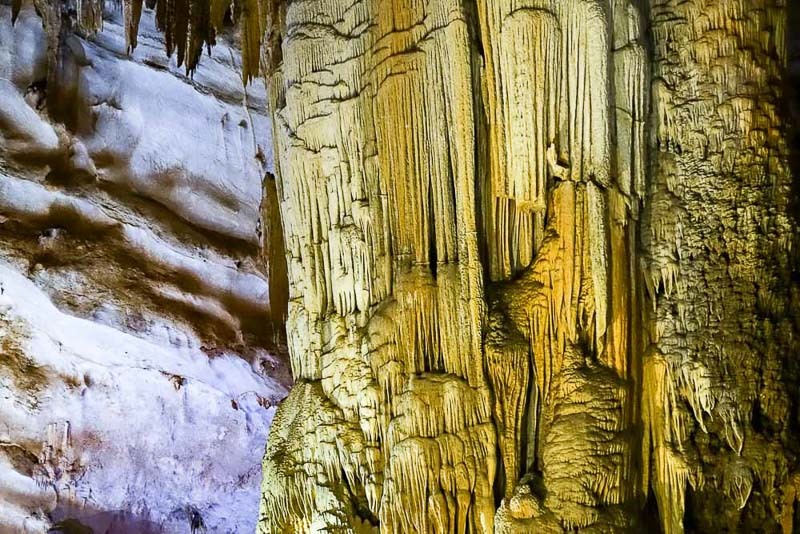 But the main reason I don’t recommend this, is because I think there is so much more to see in the Phong Nha area, that you really should stay a day or two. The town looked well set up for visitors, and I have heard great things about some of the homestays in the area. 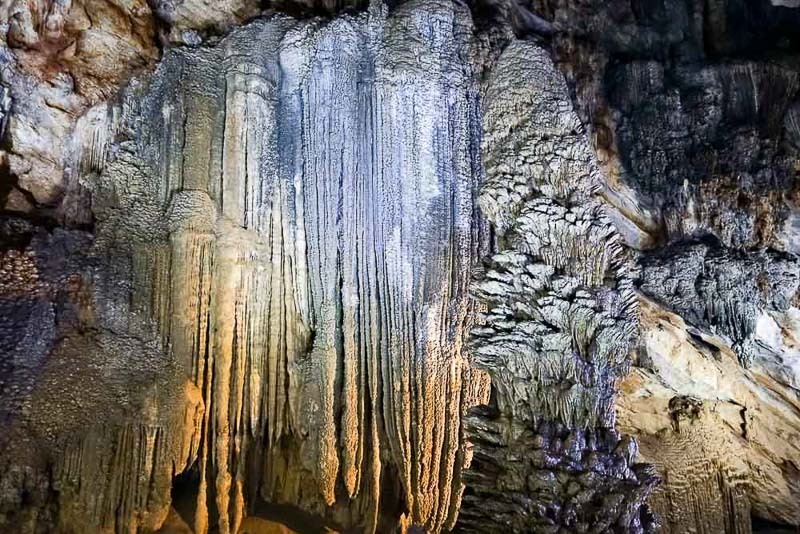 There are many activities from hiking to caving, rafting to biking, to keep you busy. With tourism only recently coming to this area, it still has a lovely rural feel about it. I will try to visit again for longer next time I get back to Vietnam. Our final day in Hue we joined the free walking tour to learn a little about the history of the city. 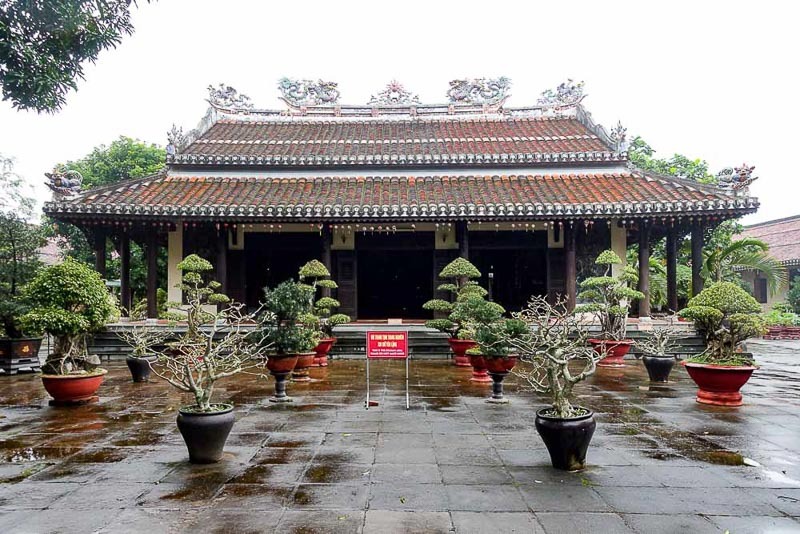 Hue is a university city, and the oldest high school in Vietnam in here. It has a strong French influence, with many French inspired words having made their way into the local dialect. The railway station, for example, is Ga Hue – “Ga” sounding very much like the French “Gare”. This was one of the better walking tours I have been on because our guide was knowledgeable and personable. The group interacted well and while there may not be huge amounts to see in Hue, I do recommend this. 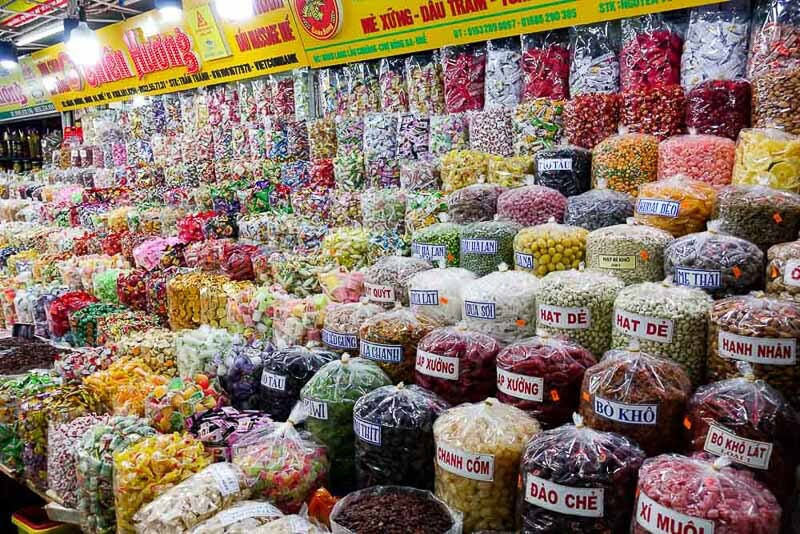 We walked through the local markets and were able to taste quite a few different things. Other tours of this kind have often just passed through. These were all sweets! We got to try some. I restrained myself and bought coconut chips instead. The tour ended outside of the well-known Citadel, but before visiting we wanted to eat, so our guide took us too a local place for lunch where I tried the local Bun Bo Hue, a yummy noodle dish. A few of us then made our way back to the Citadel for a visit. 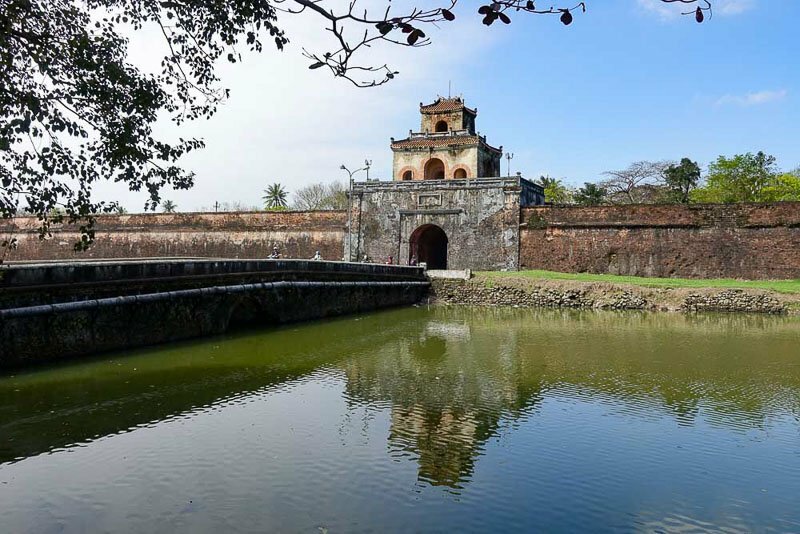 This is a huge walled area with a moat around it that over the years has housed the Imperial City, including an area called the Forbidden City that was home to the Emperors. There is a lot of open space in the Citadel now, as many of the buildings no longer exist. Those that are left are worth a quick look, but I think a visit here would be better with a guide to talk about the places and history that are no longer there. As an Australian, I am often asked about our “dangerous” wildlife. 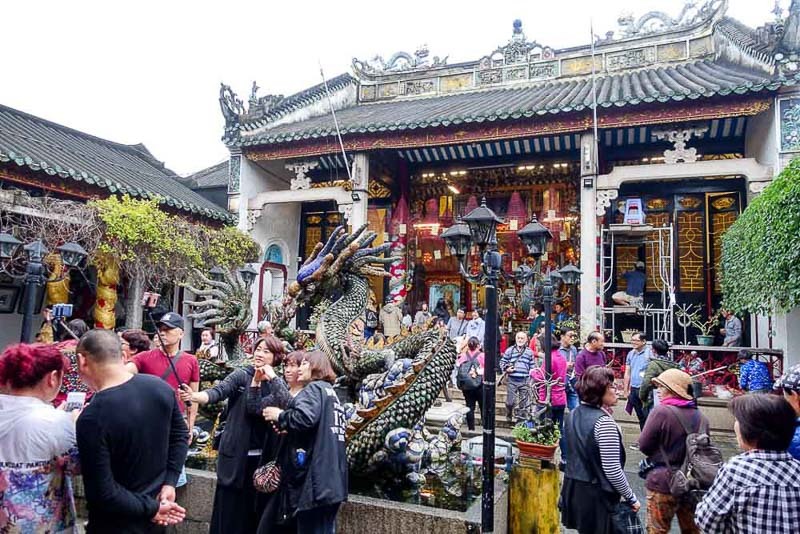 But here I am, travelling in Vietnam, a place no one associates with any dangerous animals, and in the biggest tourist attraction in this area we come across a snake! 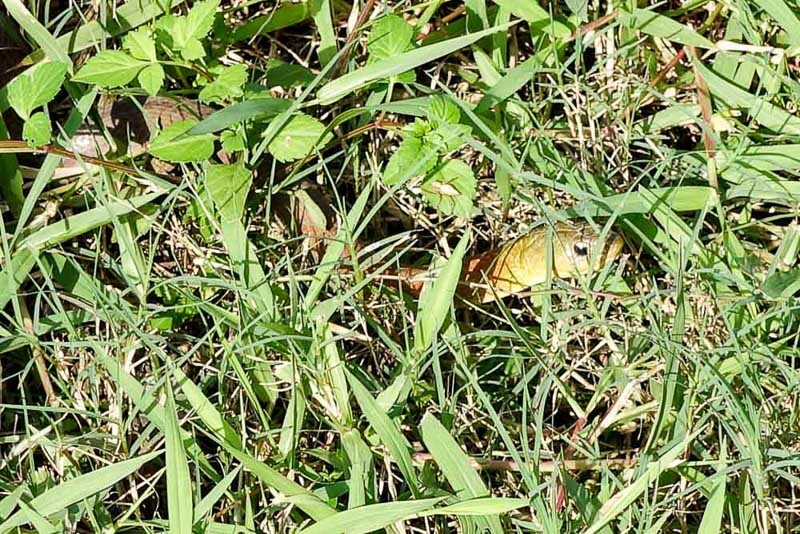 It was about 1.5m long, and slithered off across the grass as we watched. I have no idea what type of snake it is, and while I am not scared of snakes, I do know not to get too close! (I am after all a country kid from Oz, we were taught at a young age how to deal with snakes!) I am just glad that there were no tour groups in the vicinity, or mass panic may have ensued! 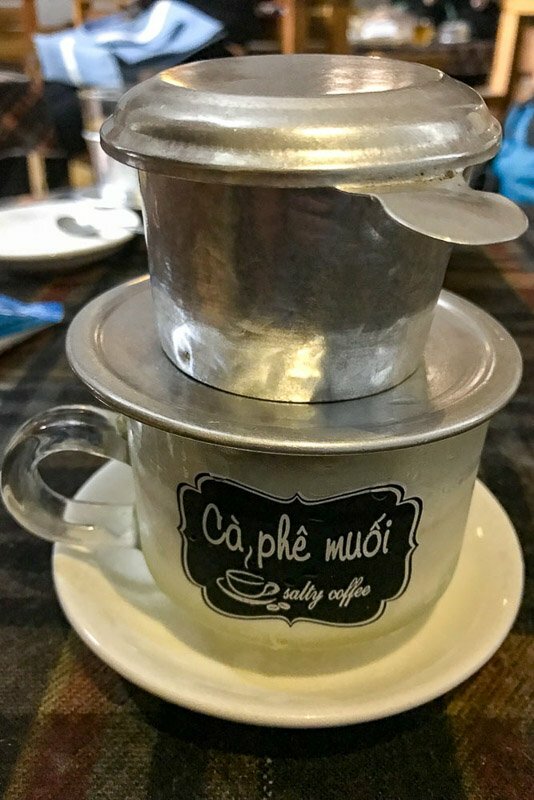 During the tour our guide had mentioned a local Hue delicacy – salt coffee! My immediate reaction was no way could that be a good thing, but curiosity got the better of us and after the Citadel three of us decided to hunt down one of the two places in town that sold it and try it out. The place took a bit of finding. Our guide had said the cafe was called Salt Coffee. Google also said the cafe was called Salt Coffee, but nowhere on the street could we find a place called that. 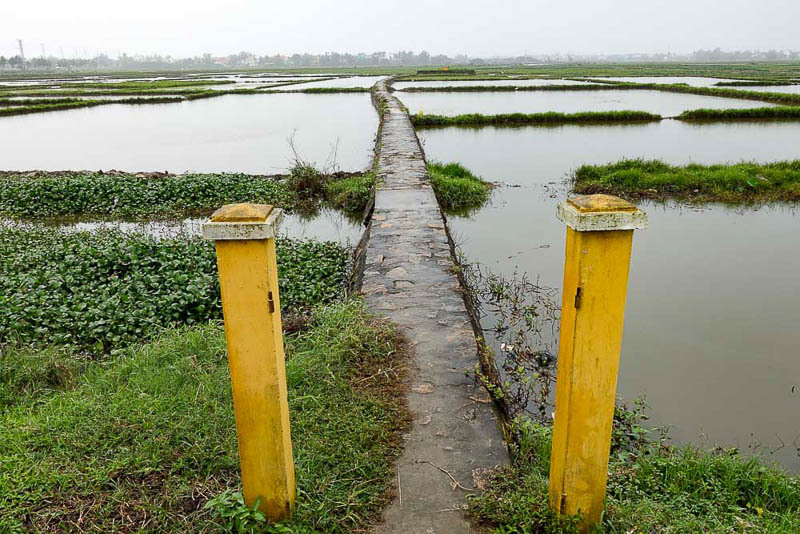 It wasn’t until I thought to translate that into Vietnamese that we found the place – Cà Phê Muối. We ordered the coffee and were firstly surprised that it came out dripping into a glass of ice! Clearly this was a cold coffee. Secondly the taste. This coffee was delicious. The flavour was a bit like salted caramel. It was so good Simon had a second cup. 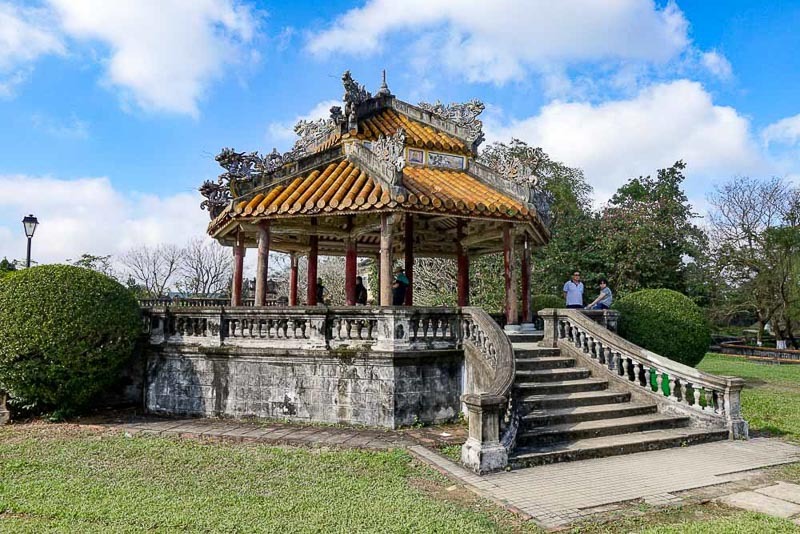 Go and find this if you are in Hue! Early the next morning we were in the car for the drive back to Danang airport. It was over two hours drive, and a bit of a splurge to hire a car, but I am a bit cautious about relying on a bus or train that could easily be delayed when we had a flight to catch. We were flying up to Hanoi, spending the night there then flying out the next morning. We didn’t do a whole lot in Hanoi except eat our last delicious Vietnamese food, but I did find a budget way of getting to and from the airport. 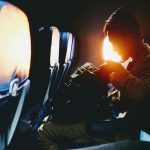 The airlines run shuttle buses, and you do not need to be on that particular airline to take them. We were going to catch a local bus, but as we walked out the door we saw someone pointing us towards a coach doing airport transfers straight into the city centre for only 30000VND ($1.70AUD/$1.30USD) and I figured we could stretch the budget to afford the direct bus (the public buses are 5000VND)! We could have got the same bus back to the airport, but I was having trouble getting information (the driver did not speak English) and the exact route that the bus took on the way in did not match with info I had been able to find online so I didn’t trust that we would make it back in time. Instead I followed the instructions in this blog post by Getting Stamped and it worked perfectly, especially since the bus stop was only minutes walk from our hotel. Our return trip was 40000VND, so still definitely affordable. I liked Vietnam the first time I visited, and I liked it more after this trip. 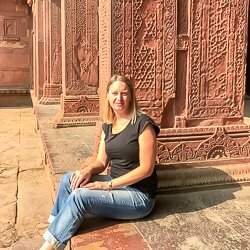 It felt easier to travel around this time, either through experience on my behalf, no kids this time, or better tourist infrastructure – most likely a combination of all three! 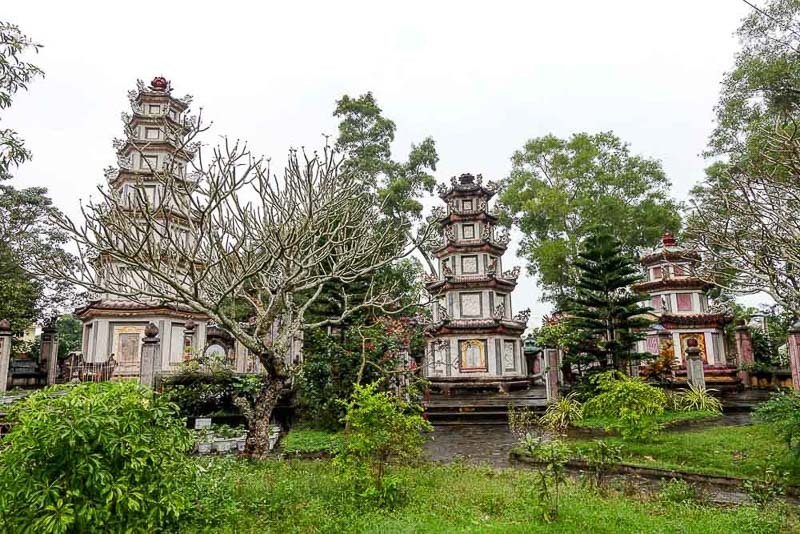 Everywhere I turn there is more to see, and while I though this would be my last visit to central Vietnam, it has just added more places to my never-ending list. Vietnam is crazy cheap! Just look at the accomodation prices below! And I can assure you we were not slumming it. We could eaily find local meals for just a couple of dollars. At times it was possible to have food and beer/wine for under $10AUD for both of us. Wifi was good after being in Cambodia! It was reliable everywhere we stayed and available at every cafe, restaurant and some attractions we visited. I half considered getting a sim card here, mostly becasue it was so cheap, but in the end didn’t bother. We didn’t use a lot of local transport, mostly we hired cars to get us around or had transport included in our accomodation (both Danang and Hue). The train was only a few dollars between Danang and Hue and local buses were only cents as shown by the Hanoi example above. I would have hapily used more local transport if required.